What time can guests start selection? The answer is in this FAQ. It says "at 7:00 AM Eastern Time". In our cases, it was Sunday night. M-chan tried to connect web site from her home in Japan, and I did from a hotel because I was away on a business trip overseas. However M-chan said she couldn't access the page for selections of FastPass+. 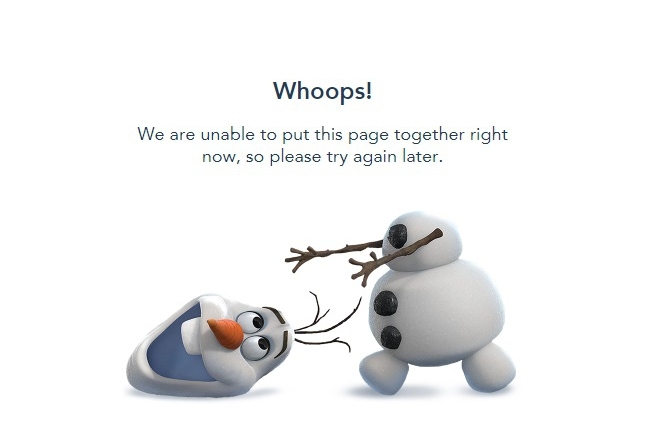 She could only see Olaf, an error screen. Fortunately, I could access, then we finally got all FastPass+ as desired. Is this because I was in overseas? I don't know the reason of M-chan's error, but anyway, we now have FastPass+ luckily. These are our FastPass+ selections. Followings are FastPass+ experiences when we selected. Experiences with "××" on top are the ones whose FastPass+ was gone as of 38 days to go. Especially, Avatar's FastPass+ was gone in only around 10 minutes. Just for your information. イッツ・タフ・トゥ・ビー・ア・バグ！/It's Tough to be a Bug! ディズニー・ジュニア・ライブ・オン・ステージ！/Disney Junior - Live on Stage! インディ・ジョーンズ・エピック・スタント・スペクタキュラー！/Indiana Jones(tm) Epic Stunt Spectacular! In addition, there are lists of status of FastPass+. These are also good information.